Every now and then, you will find yourself in the need to get screen activities: to show your students how to use a software, to create a visual guide for your parents, to add some engaging effects in your work presentation...Anyway, the very first thing you need is to search for a reliable screen recorder for Mac. As bewildering options are available on the internet, chances are that your efforts will end up in vain if you unfortunately choose an improper program for macOS. However, your search ends here as we make some quick reviews of the top five best programs for Mac users. The top priority comes down to the ability to record screen on Mac. Video and games screen recording ability, Mac compatibility, video settings adjustment, smooth recording etc are all factors that attentions should be paid to. MacX Video Converter Pro is not only a powerful and customizable screen recording software for Mac, but also laden with advanced features that not available otherwise to help users to record video games, non-downloadable online videos such as YouTube videos as well as all other things on the screen professionally. Most screen video recorders do the same task however the key differences often lie in their inherent functionality and ease of use. Not all of the users are digital geeks who know the format and code stuff exceedingly well. A screen recorder with rich features, advanced settings, excellent output quality but complicated interface means useless to common users who are totally computer virgins. This one keeps a perfect balance between practicability and simplification that even those with little digital knowledge can accomplish the task smoothly. Poor output quality will no doubt be detrimental to effects, interests of the video and even the enthusiasm of the maker. MacX Video Converter Pro excels others as it deliveries an recorded screen videos in 1080p full HD. As firstly referred herein, the pursuit of maximum value of the money never stops. The title "best" never comes easily and the ones rank on the top are always those with more useful functions. As a matter of fact, screen recording is just a small drop in the pond relative to video converting ability as it is specially designed for video converting than screen capturing. Besides, YouTube video downloading, photo slideshow making, video editing and many other useful options are also available. MacX Video Converter Pro is a video converter yet strong tool especially working under Mac OS X which is packed with 320+ video and 50+ audio codecs. It features a screen recorder, which has a knack for capturing everything on Mac screen. You can simply capture any video from non-downloadable websites like HULU, BBC, etc and even iTunes DRM videos, so as to play these videos on iPhone, iPad and Android offline. No.1: Strong video and audio capture ability allows users to record YouTube, gameplay video on the screen, including online videos, video cameras, microphone and computer's audio in high quality. No.2: A full set of recording settings allow users to adjust the recording areas, video quality, frame rate, simple sound effects etc very easily. No.3: Built in 320+ video and 50+ audio codecs, users can convert the recorded video to various popular formats and mobile devices directly with this screen capture software. No.4: Unlike some tools which may crash running on latest macOS, this software works smoothly under the latest macOS. QuickTime player is the built-in video player for Mac. For those who have beening using Mac for a while, they may have know that QuickTime Player is a screen capture tool on Mac. It is easy: open QuickTime Player, go to File > New Screen Recording and there you are. You can either record the full screen on macOS or part screen or just a window by drag the click. Note: However, it has its drawbacks. This free screen recorder for Mac is able to capture Mac screen with microphone sound. If you want to record both screen and Mac audio the same time, you can rely on a free third-party app called SoundFlower, which however stops updating to supported El Capitan and later macOS. 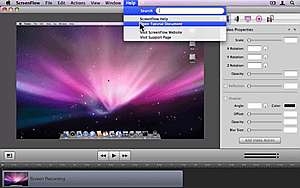 ScreenFlow is a video capture, editing and screen recording software designed by Telestream for Mac systems. It is one of the best and also most expensive ones you can get. Available at $99, you can expect some powerful functionalities such as tons of advanced post-capture editing features to capture screen images or videos and make compelling videos, that's why the value might there for some users even at such a high price. Note: audio driver is disappointedly prompted to be installed when users want to record the system audio with this screen capture software for macOS. iShowU from shinywhitebox is good software which can record video and audio from screen. There are two different versions available with the full version priced at $59.95 USD and the one with fewer features available for $29.95 USD. The higher version is a more-easy-to-use tool which offers user-friendly interface and in-built options such as scalability, highlighting actions etc. Editing applications such as cut and various output formats for web, internet video, email are also available. Note: the limited version could not record the sound and minimum OSX requirement of even its newest higher version now bumps to only 10.7.x. Screenium is strong and affordable software developed by a German company Synium Software GmbH with an additional English version. The tool is similar to the ones mentioned above and can be downloaded for $39.99. It has four screen recording modes to choose from: Area (select a region), Full Screen, Mouse Area (it will follow the mouse/cursor) and Single Window (designate a window, such as the Finder). It can record up to 60fps and is able to capture 4K/5K Mac screens. Note: It won't capture mac screen videos in some common file formats, and it requires Soundflower to record video with audio on Mac. 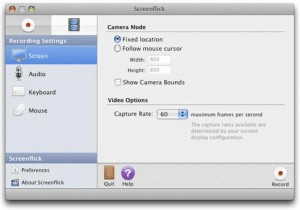 Developed by Araelium Group, Screenflick is a Mac screen recorder features with high-performance screen capturing ability. Screenflick can record any portion of the screen, as well as audio from internal or external microphones and the system. Also it has the ability to display keyboard commands and highlights on mouse clicks. An important feature is that the files can be exported multiple times in different sizes and versions, without affecting the original footage. It is simple to use even for beginners. Note: There is no dock or menu bar items, and you're allowed to ajust some simple settings of the recording like FPS. It lacks some key features that you may find on some other software. Summary: Though everyone has his own taste and it's scarcely possible to find a screen capture tool that caters all the tastes or needs, the one comes closest to what you expect is always here. From the above, MacX Video Converter Pro appears to be the most cost-effective screen capture recorder among the five top programs which offers the most comprehensive functionalities including video converter, YouTube downloader, screen recorder, slideshow maker and video editor and is available at a reasonable price. To record your Mac screen smoothly with high quality and without time limits or other restrictions, look no further than MacX Video Converter Pro. 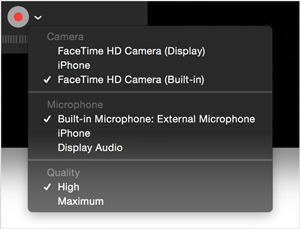 Step 1: Download this best Mac screen recorder and click the "Screen Recorder" button on the main interface. Tip: you are allowed to record anything on screen, screen activities, videos from non-downloadable websites like recording YouTube videos, music or songs. Step 2: You can customize the screen recording area by choosing "Keep Full Screen" or "Crop Region". You are also allowed to select the quality of video to be recorded, tweak the video frame rate, add sound effect to your video, and alike. You can select the audio, like system sound or microphone audio. Step 3: Click "Browse" button and select a destination folder to save the recorded screen video. 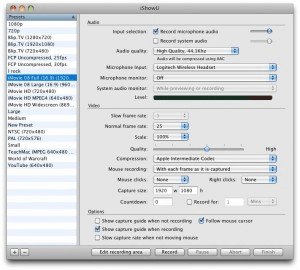 Step 4: Click "Start Record" button, the program will start to record screen on Mac.This screen recorder won't affect Mac computer's performance during recording. Note: After recording screen on Mac, just load the recorded screen video into the video converter you can further convert or edit it. You are allowed to convert your recorded video to MP4, FLV, AVI, MOV, WMV, etc for playback on Samsung, HTC, Amazon Fire Phone, iPhone, iPad etc to enjoy on the go or upload to YouTube to share with your friends.